Progressive American cuisine from Michael Beltran spices up Coconut Grove. : Former Cypress Room sous chef and Allen Susser protégé Michael Beltran teamed up with the owner of Brickell hotspot Sidebar on Ariete in Coconut Grove. Quaint and charming, the progressive American eatery boasts a dimly and beautifully lit outdoor patio, warm dining room with an open kitchen and downstairs wine cellar (which doubles as a romantic seating space). The ever-changing seasonal menu is divided by snacks, appetizers, entrées and larger plates designed to share. 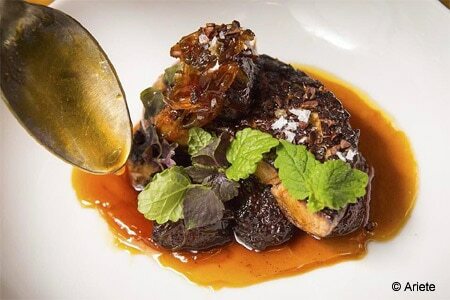 Dishes have included an innovative Miami take on foie gras with plantains, temptation caramel and cocoa nibs; grilled oysters with pungent bone marrow butter; and tender grilled short rib with red pepper jus. Go for the chicken liver mousse smeared on toast and topped with house-made red pepper jelly, as well as the wood-grilled half chicken, roasted and accompanied by local vegetables. If you're an adventurous eater, venison comes in tartare and cooked form. For heftier mains, opt for either of the house specialties: a rotating cut of meat (think rib-eye or strip) or whole catch. As for dessert, you're in for a treat thanks to Dallas Wynne, who worked under the tutelage of Hedy Goldsmith at Michael's Genuine Food & Drink. Look for buttermilk donuts with sour orange cream, crème fraîche cheesecake, and a chocolate crémeux with candied popcorn, pretzel crumble, Maldon salt, cocoa nibs and malted milk ice cream.